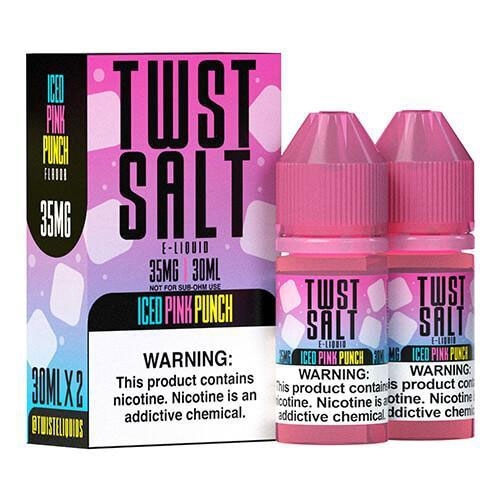 TWST Salt Iced Pink Punch E Liquid is an exhilarating vape blend that combines citrusy pink lemonade with sweet strawberry syrup and a touch of menthol for an invigorating vaping experience.This delicious nicotine salt vapor is sweet, tangy and refreshing from inhale to exhale. Lemon Twist crafted their top selling Iced Pink Punch Lemonade in a salt based nicotine (TWST Salt) that is made especially for low wattage pod mod vaping devices. Iced Pink Punch Lemonade comes packaged with 2 individual 30mL bottles so you can share with a friend. Try it today! They accidentally sent me the freebase version but were quick to fix the issue (refund). The juice tastes great and customer service is even better.